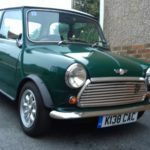 I'm brand new to this group and to ownership of a 1992 Mini Cooper K138CAC; delivered today by Andy Ace Harrison of Acespeed Historic Motorsport. I always given my cars names and this little chap is Pooh - well at least it is a (semi) polite reference to his Reg No. My late husband Mike rallied Minis in his younger days and I've bought this car partly to honour him and mainly to have fun. MY VW Caddy is great as a business vehicle, but I fancied something more fun to drive. Mind you, I will be getting back to the gym, having driven cars with power steering for some considerable time and an automatic for the last four years or so. Hope to catch up with other members in the Yorkshire area. Welcome to the forum and to Mini ownership. Your car looks lovely and how lucky for you to have had it delivered by Andy! Enjoy driving your Mini....that's the important thing!